The prototype rechargeable heat battery will be tested in two field-tests in different climate zones. The Field Test Demonstrator (FTD) is the core of WP6 of the MERITS project and the culmination of the effort from several other WPs. 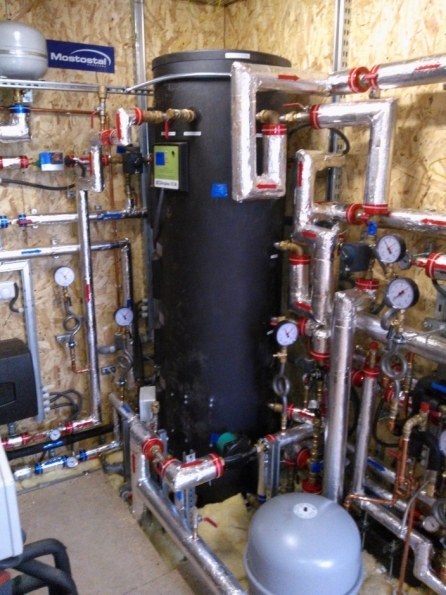 The aim of the FTD testing is to demonstrate and evaluate a compact seasonal storage system based on novel high-density materials that can supply required heating, cooling and domestic hot water with up to 100% renewable energy sources. The demonstrator arrived from Mostostal (Poland) at the University of Lleida (Spain) in April for its testing under summer conditions. The FTD is a high-cube 45 ft. sea container, divided into three spaces: a building simulation compartment, where heating, cooling and domestic hot water is demanded; a room for electrical power supply and control cabinet; and a room for all the developed and tested equipment. Moreover, four solar collectors were placed on top of the roof. The experimental campaign in Lleida has successfully tested all the subsystems installed in the prototype, except the long term storage reactors, which will be implemented once the FTD is back to Poland. The data registered during this summer campaign allow the detailed analysis of the performance of the different subsystems and provides crucial information for the validation process of the numerical models which are being developed by Tecnalia. After the successful testing campaign, the container has been shipped back to Poland in October for its ultimate test: demonstration of the thermochemical storage modules in real-life winter conditions. This is expected in the coming months.